Newmann (no, that's not a typo...) are a small British company aiming to make affordable high-quality mics with a vintage flavour. It's a laudable aim, but have they achieved it? British microphone manufacturers are few and far between — Soundfield, Coles, and Hebden Sound being the only three that come immediately to mind. However, we can now add to that list Newmann Retro, a newcomer to the market. I'm not sure how good business would be if you started the Neekon camera company or the Lexas car company, but Newmann Retro is apparently named in recognition of the technical brains behind the project, a retired electrical engineer called John Newman. However, the company is owned and run by a very enthusiastic chap called Steve Bull, who says the inspiration for his first microphone product was the years of personal frustration with the very high cost and sonic variability of classic vintage valve mics. 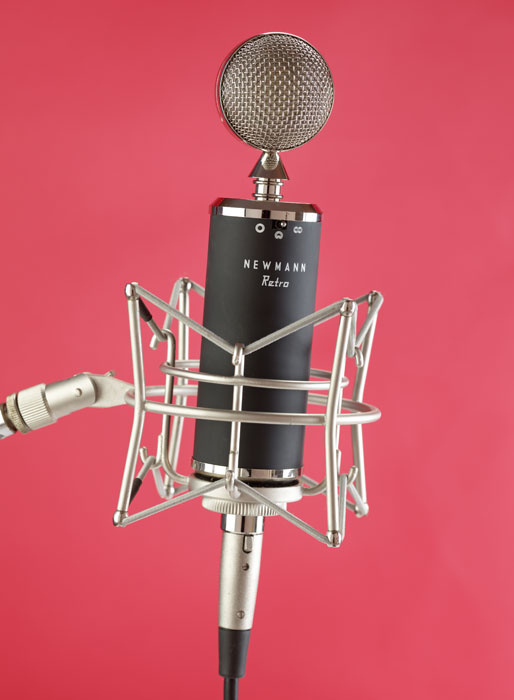 The Newmann Retro valve microphone is a multi-pattern, large-diaphragm design with distinct styling similarities to the original Neumann CMV3 'bottle' mic. Apparently, the Retro is designed and built entirely in the UK, along the same sort of lines as the growing number of 'boutique' mic manufacturers setting up all across the United States. However, the more observant might notice a distinct resemblance between the Newmann Retro and the Peluso VTB — as well as between their respective accessories — and there is certainly a general air of Chinese components and construction here (the copied Neutrik and Switchcraft connectors are a bit of a give-away!). The Peluso model has already garnered a good reputation and it costs significantly more than the Retro (its accessories are cost options, too), so this has all the makings of a bargain. The microphone is supplied in a vinyl wallet and is protected by a decent aluminium flightcase, which also contains the power supply and mains cable, a 10-metre, seven-pin mic cable, a 'cats cradle'-style shockmount (with 5/8-inch thread) and a small but stylish metal pop shield — all housed securely in a hand-cut foam liner. A simple manual is included, but in the review package there was no 3/8-inch thread adaptor included — a common omission, but a huge source of frustration for European buyers! Thankfully, Newmann listened to my concerns and have started shipping one of these adaptors as standard. In this early stage of business, the microphone is only available direct from the manufacturer in the UK, but one distributor has been signed up in the Netherlands and I'm sure there'll be many more soon. The current UK price is £495, but as the company is not yet registered for VAT, businesses that are won't be able to benefit from passing on the VAT element. Nevertheless, this is still an awful lot of mic for the money. 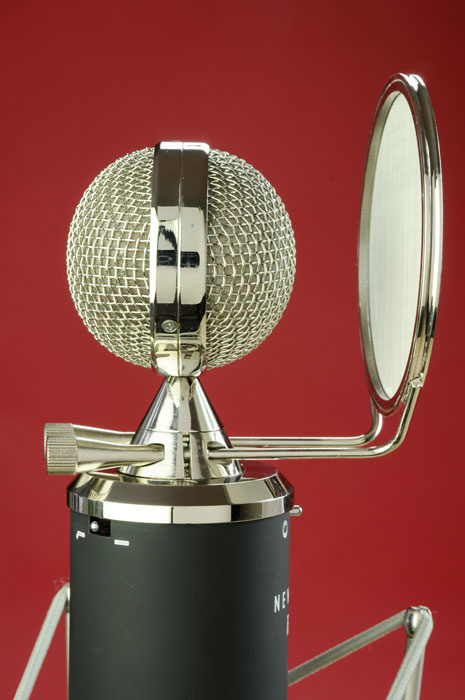 The microphone itself is quite a chunky thing, weighing in at 675 grams, with a diameter of roughly 50mm and an overall length of about 225mm. The brass body sleeve is painted black, with etched graphics back-filled in white. I couldn't find a serial number anywhere visible on the microphone, but each mic is shipped with a numbered certificate. The base of the mic carries a seven-pin XLR output socket, and a threaded collar locks the mic securely into the suspension mount. You get plenty of goodies as part of the price, including carry case, shockmount and pop shield.Three silver toggle switches are located around the top of the Retro. The front switch selects the polar pattern (omni, cardioid or figure-of-eight). The company web site and marketing blurb had previously suggested there were nine polar options, but this has now been corrected (although, interestingly, the Peluso VTB does provide nine patterns, courtesy of a control on the power supply). The other two switches provide a high-pass filter (which has a turnover frequency of 100Hz at 6dB per octave) to reduce rumbles and/or proximity bass boost, and a 10dB pad. At the top of the microphone, a chromed mesh ball encloses what appears to be a fairly standard 34mm Braunmühl-Weber capsule with gold-plated and centre-terminated diaphragms. A fine inner mesh provides a degree of pop screening, but the supplied external pop shield is well worth fitting when recording vocals. This screen clamps around the base of the capsule 'stalk' in a fairly elegant way. Unscrewing the Retro's base ring allows the body sleeve to be removed to access the valve, and the internal electronics all appear to be well put together and of a reasonable standard. The valve fitted in the review model was a (Yaqin) 6J1 pentode, which has apparently been in use in the Russian military for years! The nearest European equivalents are the (Mullard) EF95 or the (National) 6AK5. Replacing the valve should be easy and straightforward, when the need arises, it being held securely in place by a simple spring clip. The power supply is a compact brick measuring roughly 165 x 100mm. At one end is a fused IEC mains inlet, on-off switch and protected mains voltage selector (230/115V), while the other houses the seven-pin microphone XLR and three-pin output XLR. There's also a red LED to indicate when the unit is powered. Again, it appears solidly built and reliable. The technical specifications for the microphone come across as a little amateurish in their detail and presentation, but I doubt that will put off many potential customers, and I'm assured it is something that will be addressed as the company develops. The frequency response is given as 20Hz to 20kHz, but without any bandwidth limits. The published polar plots on the web site are extremely difficult to read because of their fixed size, but there appears to be an uncanny similarity between the cardioid and figure-of-eight responses. However, all three patterns seem to be fundamentally flat from 50Hz to 2kHz, with modest response ripples above, including a presence boost of around 5dB centred on 4-5kHz, and a little 'air' lift at around 15kHz. Sadly, the polar patterns' responses are only shown for 3kHz and all appear to be near-perfect — as most mics are at that frequency. The Retro's sensitivity is given as 14.1mV/Pa, which is about par for the course and a reasonably healthy level. The maximum SPL is quoted at 143dB for one percent distortion, which is pretty high, but I presume that is with the 10dB pad switched in. At 21dBA, the self-noise is relatively high by modern standards — both the Peluso VTB and similarly comparable Okatava MKL5000 are about 7dBA quieter — but it is roughly the same as the AKG C12VR and many vintage tube mics. One benefit of being a small company is the ability to respond quickly to feedback, and Newmann tell me that they've now made adjustments to the balanced output circuitry to bring the self-noise figure down to 18dBA — although I've not had the opportunity to test this myself. As always, the proof of the pudding is in the eating, and while specifications and technical measurements can be very informative, the raison d'être of a microphone is to capture and, arguably, to shape sounds — and only the ear can tell how good it is in that respect. Since almost all valve mics have their own power supply and don't require phantom power, my choice of microphone preamps to pair with the Retro was wider than usual. Purely because it is fabulous and I don't get to use it as much as I would like, I opted to use the AEA TRP preamp — a design intended for ribbon mics, but which works very well with valve mics too. The TRP is extremely clean and neutral, and very quiet to boot, so I could be sure that any sonic character was the microphone's and nothing to do with the preamp. I also used it with a GML 8400 and Focusrite 428, achieving very similar results. The stylish pop shield avoids the need to clip something ugly to your mic stand... and might even impress the odd vocalist!Since the only way to mount the mic is with the supplied cats-cradle, that's the way I mounted it — and it seemed to serve the purpose of isolating stand vibrations pretty well. However, the microphone does seem quite sensitive to vibrations coming up the mic cable, which is relatively stiff and heavy. There's no mechanical cable decoupling provided on the cradle at all, so I would recommend taping a loop of the cable to the stand, to try to isolate as much vibration as possible. Overall the Newmann Retro's sound character is fairly neutral, but with a crisp and airy top end. This brightness isn't overdone and it didn't over-emphasise vocal sibilance, but it certainly adds a sparkle and sheen to instruments like acoustic guitars, percussion and pianos, as well as capturing a lot of detail. The bottom end of the spectrum is well balanced but slightly 'laid-back', and that creates the impression that the deep bass is not as extended as some other mics. Again, this didn't cause any problems with a wide variety of sources, and if anything it contributed to clean-sounding mixes without the need for 'window filtering'. The Retro is quite 'tubey' in its character — I think few would be in any doubt that this is a valve mic — but the effect is not as overdone as many I can think of. Overall, the spectral balance seems very well judged and the slightly rich quality through the mid-range isn't overly plummy or bass heavy in the way that a lot of valve mics can be. Thanks to the overall neutral character, most vocal and instrumental recordings sounded good in a mix without needing much, if any, EQ — something that I think is always the sign of a very 'usable' microphone. In cardioid mode, the proximity effect is moderate and easily workable, although I noticed a distinct trend towards hypercardioid with a rear tail at low frequencies. Through the mid-range and high end, the pattern was far better controlled, affording better rejection of spill or room ambience. The omni pattern lost a little HF at the sides, but then most switchable-pattern mics do. The figure-of-eight pattern had nice deep side nulls and the same sound character front and rear — so you could use this mic as the side element of an M/S array. Close vocals without a windshield resulted in a few plosive pops, but fitting the supplied screen cured that easily enough. However, you wouldn't want to have to fit and remove the pop screen often — I found it a bit too fiddly for that. The microphone appears to have plenty of headroom, and I rarely needed the 10dB pad. I hardly used the low-cut filter either, such was the controlled low-frequency response of this mic. 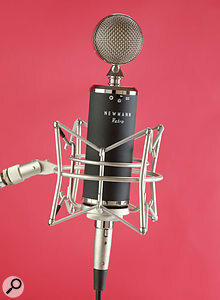 The mic's relatively high self-noise became apparent occasionally when comparing it directly with solid-state mics, so I don't think the Retro would be my first choice for spoken word or exposed, delicate solo instrument recordings — but having said that, it was never a problem within a full mix. On a couple of occasions I noticed a tendency for the Retro to pick up mains hum, but this always turned out to be because the power-supply mains lead had inadvertently become wrapped around or placed across the microphone cable, and separating the cables resolved the problem completely. Clearly, there was some sort of induction issue there, but I'm told this has been fixed with an improved cable in all current models. I also noticed a distinct 'ping' sound whenever the mic was subjected to any physical knock. Changing any of the switch positions would generate it, as would tapping the mic or capsule mesh. This seemed to be some kind of mechanical resonance within the capsule itself, and once the ear had locked on to it, it was quite recognisable. Fortunately, it didn't seem to cause any problems during recordings, but it is clearly a concern and some further attention to capsule damping or component tensioning is probably required. I grew to like this microphone a lot during my time with it, and there is no doubt that at the current asking price it is a considerable bargain. It looks stylish and well made, and with the supplied pop screen fitted will buff the ego of any vocalist. What Steve Bull lacks in marketing experience and technical standing he more than makes up for in sheer enthusiasm and support, and customer feedback seems very positive. Let's hope that this niche British company can make enough of a name to be taken seriously against the big boys. Their first product certainly stands them in good stead. The www.microphone-data.com database suggests that there are currently 114 valve microphones on the market, 63 of which have switchable patterns, of which only about 10 of the latter group fall into the 'affordable' bracket. 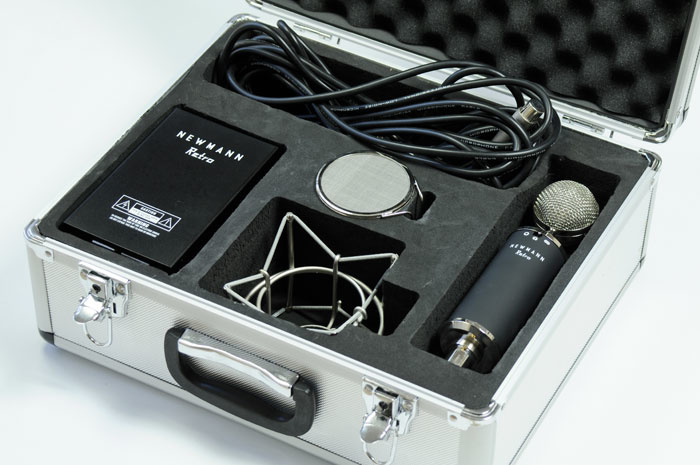 Given that the mechanical styling of the Newmann Retro is a key element of its attraction, comparable 'bottle'-style mics include the similarly priced and specified Oktava MKL5000, and the fixed cardioid Sontronics Omega, which is a little cheaper. Much more expensive options retaining the styling cues include the Blue Bottle and the Red Type A. A new British mic manufacturer. Detailed, airy and slightly rich sound character. Supplied with shockmount and pop shield. Prone to mechanical shock 'pings'. This switchable-pattern, large-diaphragm valve mic is assembled to high standards in the UK, is attractively priced and has a bright, airy and detailed sound character.